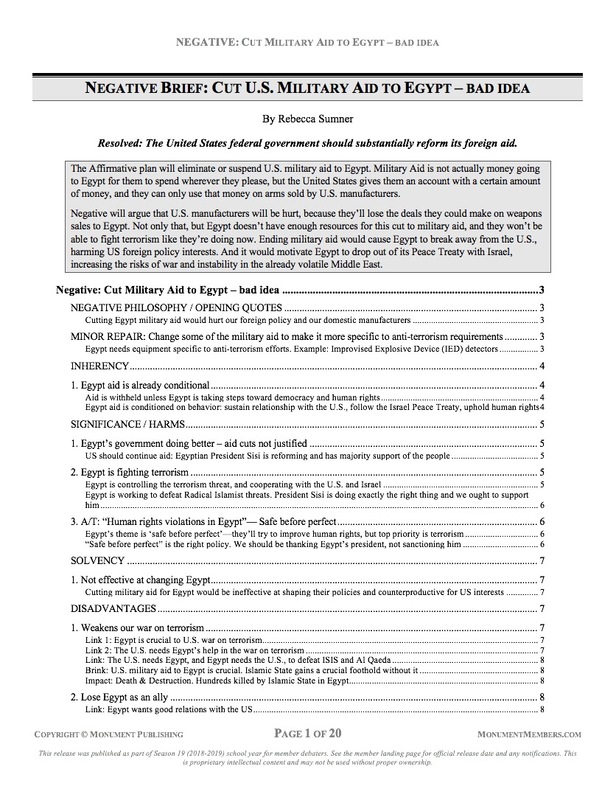 The Affirmative plan will eliminate or suspend U.S. military aid to Egypt. Military Aid is not actually money going to Egypt for them to spend wherever they please, but the United States gives them an account with a certain amount of money, and they can only use that money on arms sold by U.S. manufacturers. Negative will argue that U.S. manufacturers will be hurt, because they’ll lose the deals they could make on weapons sales to Egypt. Not only that, but Egypt doesn’t have enough resources for this cut to military aid, and they won’t be able to fight terrorism like they’re doing now. Ending military aid would cause Egypt to break away from the U.S., harming US foreign policy interests. And it would motivate Egypt to drop out of its Peace Treaty with Israel, increasing the risks of war and instability in the already volatile Middle East.